This article explains what bitcoin is all about and how and what you should know about it. Bitcoin and cryptocurrency are the talk of the year. Today, the price of bitcoins has reached over $16,500 per coin from $500 per coin within past 12 months with the market cap more than $270 billion. Besides Bitcoin, Ethereum, Bitcoin Cash, Ripple, Dash, Litecoin, and NEO are other major cryptocurrencies in the market. The growth of Bitcoin has attracted so many new investors from around the globe. But what amazes me is how few people really understand what Bitcoin is all about. In this article, I’ll try to explain it in a simple language that even a dummy could understand. Bitcoin is a digital currency also known as cryptocurrency or virtual currency, built on top of the blockchain technology. Yes, bitcoin is nothing that you can print, touch, feel, or store in your safe or wallet. Bitcoin is virtual. Technically, bitcoins are bunch of numbers (0s and 1s) stored on a bunch of computers around the world. Bitcoin is built on a technology called blockchain. Blockchain is the reason why Bitcoin is so popular. Blockchain is a technology to create, store, and manage digital transactions that are public, secure, and distributed. You can learn more about blockchain here: What is Blockchain. Bitcoin was created in 2009 by an unknown individual or a group named “Satoshi Nakamoto” to provide a way to pay for transactions without a third-party like a bank. The transactions occur between two parties without any middlemen. There are no transaction fees and both parties are anonymous. When you buy bitcoins, you get a unique digital address that becomes your identity, and that address is used for every transaction. Some pundits predict that Bitcoin (and cryptocurrency) is the future of money. They say, eventually, actual physical currency will start diminishing and digital currency will start appearing. Time will tell! Today, many tech-savvy online retailers accept bitcoins. You can order services like Web hosting, buy merchandise, and even a coffee. Many online shopping carts that accept bitcoins will have an option similar to the following cryptocurrency icons: Bitcoin, LiteCoin, and Dogecoin. Here is an example of DirectNic offering cryptocurrency payment options. Some known businesses which accept bitcoins include Virgin Galactic, Overstock.com, TigerDirect, Dish Network, Expedia, Newegg, Directnic, Microsoft, Zynga, Starbucks, and Subway. If I can buy everything using my credit card then why do I need bitcoins? Bitcoin is a new form of currency. Some people believe that the value of bitcoins will grow over time once more and more people and businesses start using them. People buy bitcoins as an investment vehicle. As a matter of fact, the value of 1 bitcoin has increased from $500 to $16,000 in past 12 months. Some people are frustrated with current banks and financial institutions. They would rather pay via bitcoins. Bitcoins may also be used to stay anonymous when paying for services and products. There are several cryptocurrency marketplaces (online websites or apps) called “cryptocurrency exchanges” that allow people to buy or sell bitcoins using different currencies. You can buy bitcoins using your local currency and start buying and selling bitcoins like any stock trade. When you open an account, you get a digital address and that address is your identity to buy, sell, or pay in bitcoins. Here is a list of some of the top cryptocurrency exchanges. Bitcoins are stored in your online accounts like your bank account, called a “digital wallet”. Digital wallets are stored in the cloud or on a server and are used to buy and sell bitcoins, and transfer bitcoins from one account (address) to other account as a form of a payment or transaction. Let’s say, you want to buy a sofa from Overstock valued at $1,300 and the current bitcoin price is $13,000. You will send 0.10 bitcoin to Overstock for the item. There is no bank or credit card involved in the transaction. What is the risk in bitcoins? Bitcoin is a virtual currency and has no tangible value that you can hide under the bed and use in difficult times. Bitcoins are not accepted everywhere. Bitcoin value fluctuates a lot. Even though the value of bitcoin is going higher, it doesn’t mean it will not go down. There may be a day, when bitcoin could go down 30% in just matter of hours. Some experts have even predicted that Bitcoin is a bubble. Bitcoins are stored in digital wallets and there have been many hacks into these wallets and bitcoins have been stolen. More and more hackers will target bitcoins as the value grows. Bitcoin is not owned by a country, group, or person. Bitcoin is owned by users of bitcoin. Initially, new bitcoins have to be mined and the miners get some bitcoins, those later can be sold to other people. Today, many large institutions and crypto leaders have invested heavily in Bitcoin. 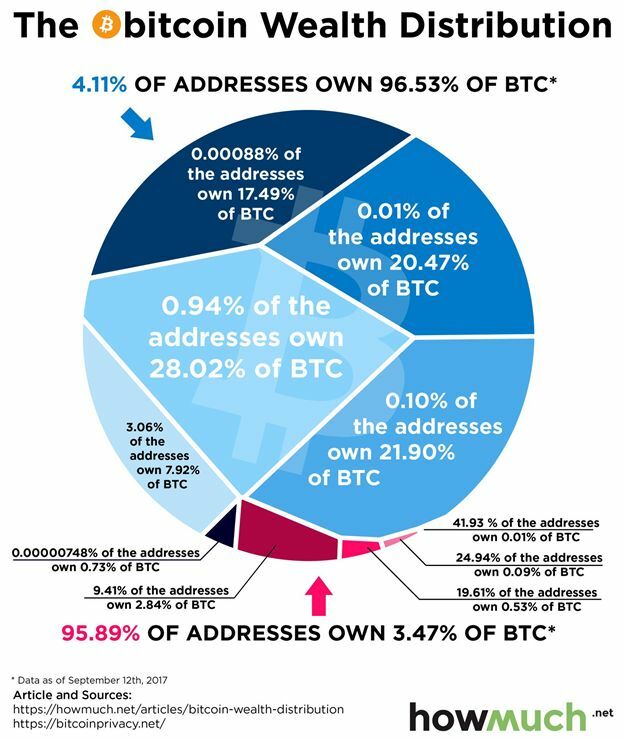 As a matter of fact, 4% of people own 96% of bitcoins. See graphic below, source howmuch. Bitcoin is not regulated or backed by any country or government. It is private peer-to-peer transaction. All parties in bitcoin transactions are anonymous. Bitcoin is not illegal but it has been regulated in some countries. Most people buying bitcoins for investment purposes are assuming the value of bitcoin will continue to grow. Some people use bitcoins to buy and sell products and services to hide their identity. References and learn more about Bitcoin here.